Our butchering date had been weighing on me for weeks. I was counting the days, looking forward to the end of hauling 5- and 7-gallon water jugs morning and night from our yard hydrant to the chicken yard and of wrestling 50-lb. bags of broiler feed every few days. But I was also dreading the slaughter – the toll I would be exacting on sixty living creatures. This was not the sort of burden I ever considered before our first harvest of meat chickens in July of 2011. 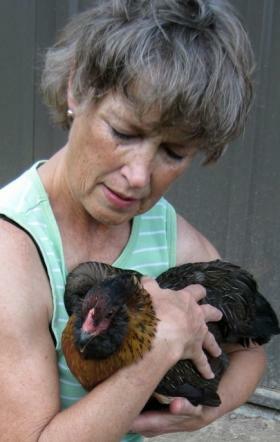 Last year, I had worked hard keeping our birds alive through the extremes of the July 2011 heatwave. We lost several to the heat. So, after working so hard to keep them alive, it was troubling to turn around and have them butchered. 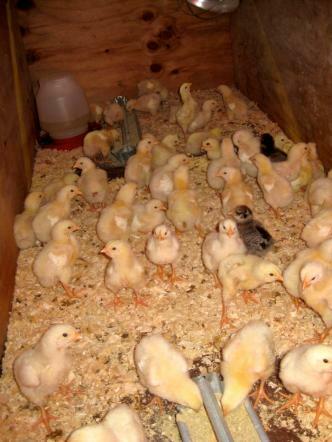 In that first year, my husband and I learned a lot about how not to raise chickens. We learned that our Salatin-style tractor pen was no substitute for giving birds free range on a pasture. We learned that as our cockerels (male chickens) matured, they become crowded and immobile, which was a threat to their genetically-vulnerable hearts and legs. We learned that when a chicken is hot, crowded, and confined, it’s not a happy chicken. And we believed it was our job – our end of the bargain – to give the birds a good life in exchange for the great-tasting, clean protein they would supply to us. When the butchering was done, we had big, delicious 7 to 8-pounders, but the chickens hadn’t had as great a life as we had imagined they would. This year was going to be different. We put everything we learned the year before to work to give our chickens much happier lives. We made sure the birds had continuous access to shade. We confined them in the tractor pen only at night to bed them down in a safe enclosure. By day, the pen went up on blocks as shelter from wind, sun, and what little rain came down during their 10-week growing cycle. This year the chickens free-ranged in a large fenced pasture, fortified in every direction – with buried hardware clot, electrified wires, and a full canopy of netting – to ward off burrowing invaders, fence climbers, and raptors. Every morning, noon, and suppertime as I’d approach the pasture to replenish feed and refresh the water, I was met by a stampede of appreciative white chickens. From a small box of sixty tiny peeping birds that arrived at the post office one morning in early summer, to a finished flock ten weeks later, the process was intense, physically demanding, and unexpectedly endearing. Wheeling the ChickensOf course, butchering was built into this bargain. 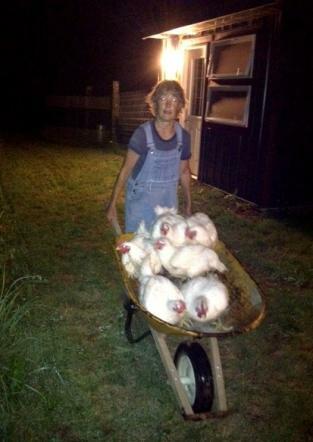 The night before the chickens’ appointed processing date, we removed their pen to make it easier to collecting them. After dark, when they were nested into one big warm docile pool, we moved them by wheelbarrow-loads into a horse trailer for the night, so that at dawn, we’d be all set – without undue trauma to the birds – to drive to the USDA facility in Utica, just 15 minutes from our farm. Much as we tried to minimize the toll, butchering was still bittersweet. 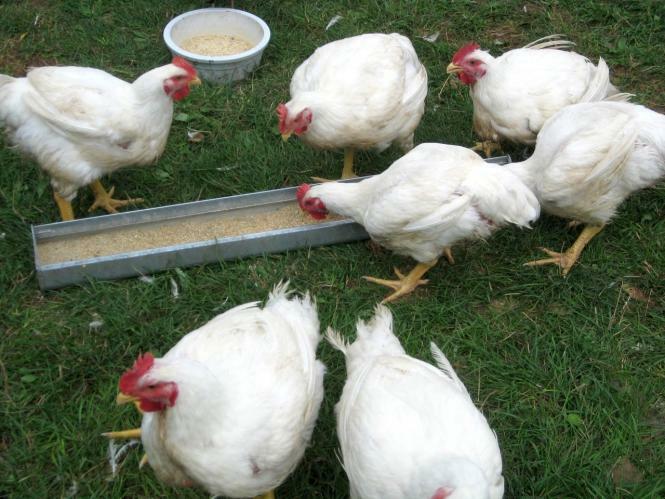 While raising our own chickens on organic feed and a big pasture of bugs and poultry grasses gives us access to a good, clean source of protein, it also raises our awareness of how much meat we put on our plates. The process makes me appreciate the perspective of Frances Moore Lappé, author of Diet for a Small Planet, which was published back in the late 1970s. Lappé believed we could (and still can) feed the whole planet, if only we stopped feeding animals the grain that might end world hunger. Maybe solving world hunger isn’t quite as simple as that, but it’s a promising premise. That said, I do believe in small mixed ag farming. A flock of chickens, a few head of livestock, pastures, restored prairies, cover crops, and gardening can make up a healthy, interconnected system that feeds us well and also provides extra for sharing, while it enriches the soil and safeguards the future of our landscape. We feel lucky to live in a rural area with friends and neighbors who share their knowledge about chickens and gardening, cooking and canning, and so much more. As a result, we enjoy greater self-sufficiency and a healthier lifestyle. Kitty Baker grew up on a mixed ag farm, then in a small town, near Rochester, MN. She and husband Keith raised two daughters, living in Kansas City and Minneapolis. A professional writer, Kitty enjoys topics of lifestyle and food, especially since 1999, when they bought a farm, Root River Wilds, just north of Lanesboro, MN. The farm’s spectacularly varied acreage -- bluffs and woods, pastures and restored prairies cut with trails and wrapped in the oxbow of the North Branch of the Root River -- is rich with opportunities to discover and share ways to live abundantly. Her last article for SGT was: Straw Bale Gardening, Part Three: The Final Report.